Product Description: The WEN 56200i is an inverter generator which means that is has a low total harmonic distortion (THD) and thus safe for connecting sensitive electronic devices like mobile phones, laptops and cameras. The sine wave is so steady that the WEN 56200i is fitted with USB ports for direct charging of personal electronics. This inverter generator falls in the 2000 watts category, which is an average power output for inverter generators of this size. However, you can double the power output by adding the separately sold WEN 56421 Parallel Kit. This model is ideal for camping and hunting trips because it is so lightweight and easy to carry around by its handle. Fuel efficiency is also decent which is why the small fuel tank poses no problem for recreational use. The WEN 56200i is a lightweight portable generator in the 2000 watts category. None of that may sound all that special but what is special is how affordable this model is for an inverter generator. The WEN 56200i is one of the most affordable big brand name inverter generators in its class. So, how does the price of this portable generator translate to its features, tech specs, reliability and quality? A small inverter generator is usually designed for recreational use so then you would be looking for a quiet model, portability and easy setup. 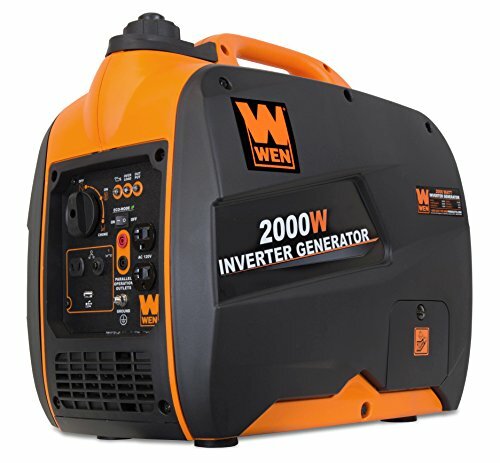 The WEN 56200i checks all these boxes but how does it compare to other similar portable generators? We have done in-depth research on the WEN 56200i using product descriptions, professional reviews and user opinions. Let’s take a closer look at the WEN 56200i and see how it compares to similar inverter generators. The WEN 56200i is an inverter generator which means that is has a low total harmonic distortion (THD) and thus safe for connecting sensitive electronic devices like mobile phones, laptops and cameras. The sine wave is so steady that the WEN 56200i is fitted with USB ports for direct charging of personal electronics. On top of that, the manufacturers have used a sound canceling design and mufflers to make the generator as quiet as possible. 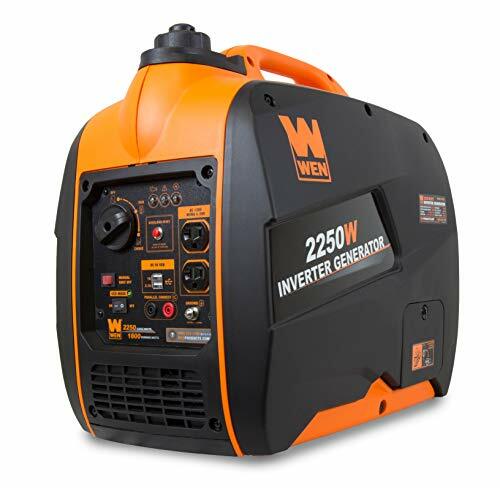 As far as portable generators go, the WEN 56200i is a very silent model. The WEN 56200i runs on a small 4-stroke 79.7 cc engine. It is powered by gasoline which you can fill up in its 1 gallon fuel tank. 1 gallon is quite standard for inverter generators of this class. A full tank provides enough fuel for running the generator for 6 hours at a half load. One good feature about its engine and emissions is that the WEN 56200i is both EPA III and CARB compliant. This means that it releases clean enough exhaust for use inside national parks and anywhere in the state of California. This generator also has an eco-mode which improves its fuel efficiency which automatically adjusts the engine speed to the connected load. The eco-mode setting reduces the fuel usage but also makes the engine run quieter when there is a smaller load connected. The power output of the WEN 56200i is measured at 2000 watts surge power and 1600 watts running power which is quite standard for this type of inverter generator. The generator is fitted with one 5 volt USB port, two 3-prong 120 volt AC outlets and one 12 volt DC outlet. As with most inverter generators, the WEN 56200i produces clean energy that is safe for direct connection to personal electronic devices. The generator has a reported THD of only 1.2% at a full load. Overall, the WEN 56200i is a very quiet inverter generator model; WEN rates its noise at only 51 decibels at a half load and 55 decibels at 75% load. Both these values are quieter than the average volume of a conversation between two people so you can feel comfortable using the generator in public spaces. The design is compact measuring only 18 x 11 x 18 inches including the sturdy carrying handle. The materials used make it a lightweight model of only 48 pounds when the fuel tank is empty. The WEN 56200i is user-friendly thanks to its simple control panel including indicators for low oil levels and overloading. It also has an automatic low oil shutdown, low fuel shutdown and overload protection as a preventative measure for possible damage and hazards. Start the engine using the manual recoil system. The rest of the starting process is simple thanks to the intuitive control panel that includes an on/off/choke turning knob. The closest model to the WEN 56200i from the same manufacturer is the WEN 56225i which has slightly more power. The 56225i has a reported power output of 2250 watts surge power and 1800 watts running power which is approximately 200 watts more than the WEN 56200i. The engine is the same in both models (4-stroke 79.7 cc) but the extra power in the WEN 56225i does mean slightly more noise with a rated 53 decibels at a quarter load (still more quiet than a window air conditioner). Surprisingly, despite using the same engine and producing extra power, the WEN 56225i has the same expected run time of 6 hours at a half load. With the extra 200 watts of power, you can connect an extra personal device for charging but the number of electrical devices that you can connect is still limited. This is why the WEN 56225i only has 1 extra outlet compared to the WEN 56200i which is an extra 5 volt USB port. If more power is what you are looking for then consider purchasing the parallel kit for this model which doubles your power output. With double the power at 4400 watts surge power and 3600 watts running power, you could use this model as an emergency backup generator for at home. Other than power, the WEN 56200i and WEN 56225i have the same features. Both have an automatic low fuel shutdown, low oil shutdown and overload protection with an user-friendly control panel and manual recoil starter. The price difference between these two models is just over $100. So, the question is whether the 200 watts of extra power is worth the extra money for an otherwise nearly identical and equally portable inverter generator. A few examples of inverter generators that are comparable to the WEN 56200i are the Briggs & Stratton 30651 P2200, the Westinghouse iGen 2200 and in a higher price category the Honda EU2200i. All of these competitor models have 200 watts more surge power but their other specs are quite similar to the WEN 56200i. Having less power is also the first noteworthy difference. All four models are parallel capable so if you are looking for a little extra power then you might want to look into the comparable models. When talking about power you also need to talk about run time but unfortunately, despite having 200 watts less power the WEN 56200i does not have a significantly longer run time. At a 25% load the WEN 56200i has a projected 8 hours of run time which is the same as the Briggs & Stratton 30651 P2200 and Honda EU220i. At 48 pounds, the WEN 56200i is just two pounds heavier than the Westinghouse 2200 which is the lightest model. This is still far below the Briggs & Stratton 30651 P2200 which weighs 56 pounds. The WEN 56200i is one of the most quiet portable generators, especially compared to the Briggs & Stratton model and Westinghouse model. Only the Honda EU2200i wins on the noise front from the WEN 56200i. The main advantage of the WEN 56200i over its comparable model and even its bigger brother the WEN 56225i is its price. The WEN 56200i is the most affordable model in the group while still having very similar features and specs. Another plus point is that it is on the lower end of noisy portable generators with a rated 51 decibels at a quarter load. This is extremely quiet, even for an inverter generator. We also appreciate how lightweight it is at only 48 pounds. Its weight in combination with the low noise production make the WEN 56200i a great portable inverter generator model for camping and use in other public spaces. As you are used to from inverter generators, the WEN 56200i provides clean energy that is safe for direct connection to a personal electronic device via the USB port. This model is one of the cleanest alternative energy sources with a reported 1.2% THD so even the most sensitive devices can safely be used with this inverter generator. Connection to the WEN 56200i is also simple. It has three different outlet types, (2x 120 volt AC outlet, 1x 12 volt DC outlet and 1x 5 volt USB port) which are more than sufficient for most recreational uses. Even though this is one of the more basic inverter generator model, it still has very handy features such as a low fuel shutoff, low oil shutoff and a circuit breaker. Usually these are the kind of features that the manufacturer foregoes to reduce the price. We also like the added feature of an eco-mode. This not only makes the engine more fuel efficient but it also reduces how much noise it makes. Going from the reviews, one of the most common complaints is that the unit presents issues just after its warranty time ends. The WEN 56200i has a two year warranty which if you compare to some of the other manufacturers that offer 3 years warranty or even 5 years warranty is somewhat short. Another common complaint is that refueling neatly is a bit of a challenge. The fuel cap is somewhat small so you really should use the funnel that I comes with to avoid spilling gasoline. Also, look out for any damage to the unit because of poor packaging. If you bought your WEN 56200i via Amazon then you should receive either a new unit or have the broken elements replaced through the warranty. Draining and cleaning the fuel tank and changing the oil is quite the task on most small portable generators and the same goes for this model. Cleaning the fuel tank requires taking the generator apart so set aside a while every few months to perform proper maintenance. In conclusion, the WEN 56200i is a great affordable option for a small portable inverter generator. It is lightweight, has decent power with decent run time and is parallel capable. It is a quiet model so you do not have to worry about bothering any neighbors on a camping trip in a national park or elsewhere. You are allowed to use this unit anywhere in the United States since it is both EPA III and CARB compliant. We do not recommend this model as a home backup generator during emergencies. It does not have enough output to power all the home essentials at the same time. Also, reviewers do not like how refueling can cause spillage. When you are in an emergency situation like a blackout because of a hurricane you want a backup generator that is quick to refuel. In the end, the WEN 56200i was designed for recreational use and for that purpose it functions well and checks all the requirements. If you like to go camping or fishing then this is a good option. The WEN 56200i is good quality for what you pay for it, dare we say it delivers more than expected for its price. Sure, the Honda EU2200i is unbeatable in terms of reliability but for its price range the WEN 56200i does what is expected. This may not be a heavy-duty generator that is suitable for intensive use but that is also not what this model is intended for. Its electrical output of 2000 watts is already an indicator that it is meant for light use. Looking for an affordable inverter generator that you will only use occasionally for recreational purposes? Check out the WEN 56200i.